Japan released the 30-y Bond Auction data and the US will publish IBD/TIPP Economic Optimism and Factory Orders m/m. The support rests at 105.820 with resistance at 106.570 which the weekly pivot point at 106.210 is located in between the lines. 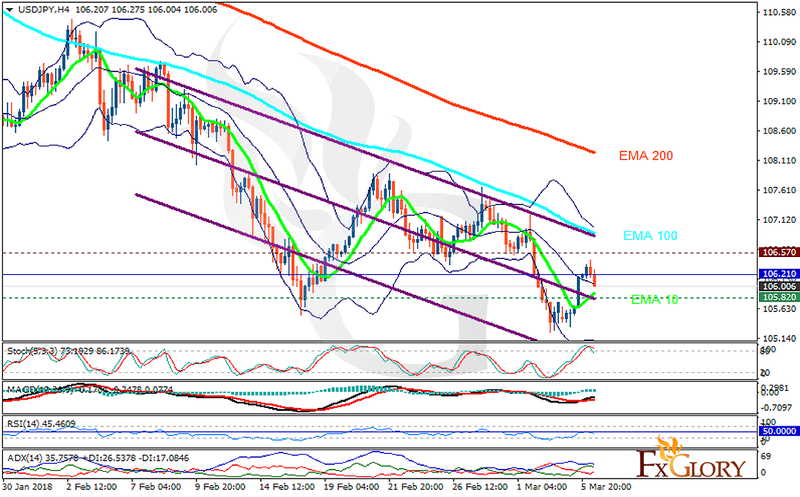 The EMA of 10 is moving with bullish bias in the descendant channel and it is below the EMA of 200 and the EMA of 100. The RSI is falling towards the oversold area, the Stochastic is showing downward momentum and the MACD line is above the signal line in the positive territory. The ADX is showing weak buy signal. Short positions are recommended towards 104.7.